On the screen, the car speeds along the road, narrowly avoiding a collision with a pixelated guardrail. The game on display, titled “spy racer,” is the result of 76 lines of code written by a 10-year-old. Local Frisco Elementary student Eamonn Fallon developed the application using “Bitsbox,” an introduction to coding created by a Boulder startup company. 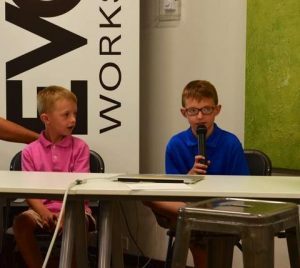 “My favorite part is just coding the apps and playing with the apps,” said seven-year-old Owen Fallon, who also took the five-week Intro to App Development course through Evo3 Workspace in Frisco. Evo3 founder Aaron Landau presented the spy-themed pilot program before several tech-minded Coloradans. He touted the program as an opportunity to allow youngsters to enter the world of coding and app development — though to them, it’s all a game. The Colorado Tech Tour stopped in Summit County on Tuesday to spotlight local startups and educational opportunities at the heart of the Rockies. The Colorado Technology Association created the statewide event last year. “Call us in 10 years, 15 years, and we’ll have a job for you,” Colorado Technology Association CEO Andrea Young said to the students, with a grin. The Denver-based company focuses on advocacy and talent development, growing existing tech companies and sharing their impact on local economies. A growing group of Summit County businesses, local leaders and nonprofits are pushing to diversify the local economy through tech. Yet, she noted, more than 46 percent of Summit County residents have a bachelor’s degree or higher. “We are completely underemployed,” she said. According to the Colorado Department of Labor and Employment, for the fourth quarter of 2015, the top industries in Summit County were accommodation and food services (with an average weekly wage of $522); retail trade; public administration; arts, entertainment and recreation; and health care and social assistance. Statewide, the picture is a little different, with health care and social assistance leading the pack, followed by retail trade, accommodation and food services, educational services as well as professional and technical services. The latter brings in an average weekly wage of $1,904 per week. For Landau, the key is getting kids comfortable with coding early. With this in mind, he is launching an initiative to teach 500 kids to code within 500 days. His goal is to bring 200 local students through the five-week Bitsbox class and introduce 300 kids to coding with a modified Hour of Code featuring similar curriculum. The courses, taught by volunteers through Evo3, will be open to Summit County students grades two to five. To help support this, Landau is launching the Evo3 Foundation, with the Education Foundation of the Summit serving as its fiscal agent as the new nonprofit awaits 501(c)(3) approval. The foundation will also serve as a resource to local nonprofits in need of technical assistance, from building a better website to other tasks. “We think it’s really important to give back to this community that has done so much for us,” Landau added. In the meantime, Keystone Science School is building on its Girls in STEM program, which launched in April 2015. The program features several workshops covering everything from design to physics to ecology. Dave Miller, Keystone Science School director of education and program sustainability, said Girls in STEM was created around the need for more gender diversity within the tech industry. Two key pieces of the program include introducing mentors and teaching girls not to be afraid of “failure” when approaching difficult problems. “We try to get more women excited about STEM and improve their confidence so they will take next step,” he said. In the future, KSS will offer a tech retreat, challenging girls to answer questions through developing a website.